THERE WERE TWO buses of assembled media trailing Prince Charles yesterday as he crossed Dublin on the last day of a three-day visit to Ireland. And, like any press corps, we all wanted one thing – for Charles to say or do something newsworthy. Announce a State visit by his mother Queen Elizabeth, abdicate the throne – something like that. Throw us a bone. Obviously the very fact that he and Camilla, the Duchess of Cornwall, were in Ireland was worth column inches, him being heir to the throne and all, but given that this was the third visit the couple had made to these shores in as many years, the historic firsts had all but worn out. Indeed when the Taoiseach welcomed the 68-year-old man who would be British king into his office on Merrion Street and asked him to sign the guest book, he was able to show Charles the signatures that his parents had added on their visit in 2011. The day was, largely, about reconciliation and strengthening ties in an uncertain world. At Glasnevin Cemetery, Charles and Camilla were part of a group who unveiled four Victoria Cross paving stones at the Cross of Sacrifice. The stones remember Irish born soldiers who in 1917, were awarded Britain’s highest award for gallantry. The royal couple were then taken on a “whistlestop” tour of the cemetery, accompanied by the site’s historian Conor Dodd. They visited the grave of James Joyce’s parents, the Republican Plot, Michael Collins’ grave before arriving at the 1916 Rising Necrology Wall. The wall itself has been controversial, listing in order those who died during the 1916 Rising. John Green, chairman of the Glasnevin Trust, said the names were there “without hierarchy, without judgement” and pointed out that the ceremony came on the anniversary of both 1916 leaders James Connolly and Sean MacDiarmada as well as British soldier Harry Dickinson of the South Staffordshire Regiment. Dodd said that the prince was grounded in Irish history but asked a number of questions. He had a number of questions about the cemetery and its history and some of the graves we passed by they noted. They were keeping a close eye on what we were passing so I had to on a number of occasions make sure I knew what I was talking about. From there, the press bus sped its way to Government Buildings, after first negotiating the heavy Dublin traffic caused by closures related to the visit. A quick sprint up the stairs to the Taoiseach’s office allowed media capture a cordial conversation between the two men before Kenny showed Charles the signatures left by Queen Elizabeth and Prince Philip in 2011. After a meeting with the leader of the country, the heir to the British throne met a dog at Our Lady’s Hospital in Harold’s Cross. After viewing the day hospice, he went to see Hospice’s award-winning bloom garden, where he met with gardner Eileen Nolan. The Prince laughed when he asked about the provenance of a fountain in the garden and was told it is from the UK. 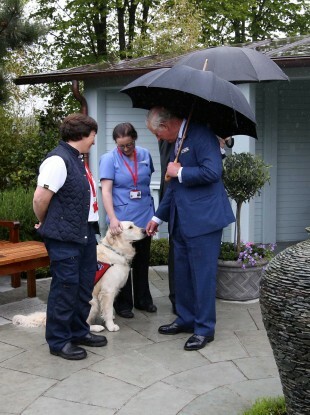 He also met with Carol Lynam and Rían – who is a therapy dog in the Hospice. It was in the Hospice that the prince’s personable nature was seen. Given that he has spent much of his life meeting people all over the world, it is no surprise he can work a room. But up close, you can see that it is a genuine interest that he shows. Before leaving, the Prince had an impromptu chat with the family of a woman who is in the palliative care unit. The woman’s family were greeted by the prince who commiserated with them. The woman’s husband, fighting tears, told the prince he was “very good” for stopping to talk. After a quick handshake and joke with Gerry Adams, Prince Charles spoke about the “shared history” of Ireland and the UK. I have been so struck by the strength of the connections between our people and our economies. These bonds shape our shared prosperity and security. He paid tribute to the “extraordinary and essential” contribution of Irish people in his country. In these challenging times, it is more important than ever that we strengthen the connections between us and forge new ones wherever we can. And that, really was the news line. This wasn’t about making massive proclamations or creating headlines. It was about popping in to see the neighbours. Email “Wreaths, the Taoiseach and a very good dog: a day spent with Prince Charles”. Feedback on “Wreaths, the Taoiseach and a very good dog: a day spent with Prince Charles”.